Welcome to Reflections. This section of AdventureDad.org is dedicated to more in depth written and video discussions about child development issues, father/child dynamics, your experiences with your dad and the emotional side of fatherhood. These reflections come from my work as a child/family therapist and from my own fathering experiences, both current, and as captured in my father’s journal which I’ve kept for the past 17 years. They are intended to be as frank and honest as possible, touching on worries, successes, joys and sorrows, while respecting the privacy of my own son who charges me $1 for everytime I tell an Alex story during my lectures! The ultimate goal of our reflections section is to increase dads’ understanding of their kids, as well as, themselves. Having self and child insight are two of the keys to being a more patient dad and to building a strong emotional connection with your kids. These reflections are also a way to keep the past alive in you and your children’s memories. Feel free to send a comment or question. 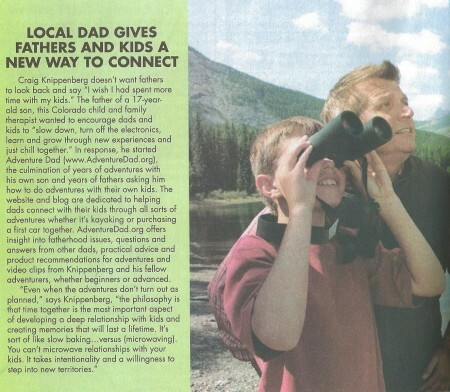 Colorado Parent Magazine (ColoradoParent.com) ran a feature on AdventureDad in their June issue. What made me particularly happy was seeing their accompanying articles about The Family Volunteer Program and the National Get Outdoors Day which took place on the 11th of June. I believe we are all on the right track! Shortly before my father’s death five years ago, I was able to share with him a list of things which he had taught me. While unable to speak following his stroke, he managed to squeeze my hand lightly and crack the smallest smile in showing his appreciation. It is a moment that will live with me for the rest of my life and has helped me grieve his loss, knowing that I got to say everything I wanted to say to him before he passed. I hope this will stimulate your thinking about what your dad taught you and what you hope to teach your son or daughter someday. I would love to hear from you and post your reflections on our site! Happy Father’s Day. “In Grace and Dignity, you taught us to live. It was in Grace and Dignity that you taught us to die”. When I was a boy, I pleaded with my father to take us to Daniel Boone State Park in southern Missouri. It was a boyhood dream and the complete adventure as I studied the legend I learned about in school. Unfortunately, the drive home went down a freshly paved country road and my father’s impeccable T-Bird collected tar in the tire wheels and siding. For several hours, my father could only complain about the tar rather than focus on the adventure. While I had vowed not to make the same mistake with my son, my own obsessive discipline and goal-oriented nature has overshadowed many a moment together. Several days ago, Alex and I embarked on an adventure to register his truck and purchase his first license plates. We searched for the closest DMV and headed out late on a Friday afternoon. After about a half hour of waiting, we realized that we would have to go to a Denver County DMV. A little frustrated, we searched on the phone for a location across town. After battling traffic for 45 minutes we realized that our next location was across the street in another county. Quickly, we searched again and found a Denver location clear across town. We also learned that we had to be there by 4:30 in order to get a ticket for the line. Probably 40 stoplights and numerous traffic jams later, we arrived at the DMV at precisely the moment the officer was locking the door. Shut out. Two hours of driving and we failed to accomplish our goal. On the long drive back home, I had some of those fatherly thoughts about how some advance research and planning should have been done. Fortunately, I bit my tongue and instead silently reflected upon how I just got to spend two hours in mind numbing traffic with my son. We listened to country music, looked at cool sports cars and trucks and teased each other. While I could see it as a failure and loss of two hours of productive time, the peace of just being with my son seemed far more compelling. It was two hours that I will always remember. Just wanted to say how much both my wife and I enjoyed hearing your keynote talk at SMART GIRL yesterday. You offered such helpful, well-founded information and advice, punctuated by perfect stories and examples that added to your credibility and our learning the important lessons in your message. Our son turned 12.5 the day before your talk and we are seeing some of the behaviors you highlighted. We left the luncheon in deep discussion and immediately began to apply what we’d learned. We also engaged him in conversation about some of the topics, with good response. BRAVO! And keep up this good and important work. Be well and enjoy your springtime adventures. We plan to have the keynote on our website: craigknippenberg.com. Several months ago, my wife and I started down the road for adopting a sweet young pre-school girl. Our time with her increased with the frequency of our visits resulting in a play date in her territory this past week. What a great opportunity for adventure time. We quickly went through books, dolls and the latest electronic toys for young ones. Eventually, we settled into a delightful adventure of the dressed up princess being held captive by the evil rubber snake. Dressed in my terra for a crown and yellow plastic bat for a sword, the King jumped into action to save his princess daughter and return her to her castle. Fortunately for the snake, he was changed into a worm with her magic wand and moved to the castle with her. What a warm, tender and fun adventure in our path of bonding together. Sadly, we learned several days ago that the adoption process will not take place. Through my sadness, I’ve held onto that adventure and the joy of being King for one day. It’s a memory I will cherish. More importantly, it’s a lesson for all dads. Take time for adventures with your kids today. Then hold onto the memories of those moments as if they could be your last. I recently had a pleasure of being on Captain Coy Theobalt’s radio show, Man Alive! (http://www.castlerockradio.com). His guest for the day was the Grateful Dad, Doug Gertner. That day’s program was on creating adventures with your kids and I got to speak about the roots and programming of AdventureDad.org. Unfortunately, the sound didn’t transfer well, but I’ve attached a brief clip of the program 1Man_Alive_2_28_11. One of my favorite parts of the show was when Capt. Coy was talking about the monster game he played with his kids every day when coming home from work. Upon entering, he would flop down on the hall floor and pretend to be asleep. The kids would run into the kitchen to get some of the monsters special wake up pills (M & M’s) and feed them to the monster. Upon waking, the monster would then spend the next ten minutes wrestling the kids in a big pile on the floor. As he talked, I quickly recalled the many joyful experiences I have had with Alex and his friends, as well as, the countless numbers of group kids I’ve taken swimming as part of my work. At the lake, the monster lives in the water waiting to challenge the children. He starts out strong, but quickly tires with the hoard of kids on top of him. All clutching his arm to prevent what is going to happen next, the monster fights to bring his hand to his mouth and take the magic power pill he needs. The ensuing mayhem is one giant laugh and soaking as children fly through the air and struggle back for control. The best part for the monster, is knowing the physics of water and how much easier it is to wrestle those buoyant kids. My hat is off to you Captain Coy for doing it on dry land! This past week, I had the privilege of hearing and speaking with Rick Lavoie, author and international lecturer. He (http://www.ricklavoie.com/aboutrick.html) is one of America’s foremost education experts. In speaking with him after his lecture on motivation, Rick recalled talking to a teacher about how her curriculum for any given day should be viewed as a compass, rather than a road map. That is, you start with a general direction for the day, but leave yourself open to detours and pulling over to the side of the road to explore the ideas and interests of her students. Naturally, I couldn’t help but think of AdentureDad. Rick captured the essence of what adventures with your kids should be. Start with a direction you want to go, do some preparation and then head out. True adventures rarely have every detail mapped out and followed exactly. On our trip to Alaska several years ago, Alex and I had planned on taking the last ferry back to Homer where we were planning on driving north. Our hike took us many directions that day and we missed the boat taxi by an hour. Heading back to the previous night’s campsite, we ran into a family who was hiking down to their boat. They invited us along for the ride back. As we chatted, the joy of meeting this family of nine (children ages 5-30), took hold and we watched the sunset late into the night, talking on their now docked boat and sipping some Alaskan home brew. Our drive back north could wait another day as the experience of that moment, with these wonderful people, was the essence of why we were in Alaska; to become lost in our environment and the lives of those we came across. As our family now looks to expand through adoption, I couldn’t help but think of my discussion with that family as I shared my dream, but also my worries about being a much older dad and having siblings so far apart. With joy in their faces, they reminded me that age doesn’t matter nearly as much as a youthful spirit, a dedication to adventure, and the love for each other. A little girl may join us soon, in part, because we pulled over from our road map for a couple of hours. If you’ve read A Father and Son Bond Down Under (/http://adventuredad.org/446/adventures/a-father-and-son-bond-down-under/), you were treated to a dad who knew his son needed emotional support and a change in his thinking. The need to accomplish and conquer is pretty much hard wired into males and the young teen it particularly vulnerable to feeling like a failure. Fortunately for Isaac, Darren was there to sense the moment and teach his son a really important lesson. Success and failure isn’t about reaching the goal, it’s about pushing past your fears and giving it a try. When counseling young teen males who are struggling with working up the courage to ask a girl out, I remind them to focus on the ask and not the response (i.e. : their fear of rejection). You are successful if you ask, an affirmative response is just icing on the cake. If you don’t ask, there is no way you will ever get a “yes”! Doug’s posting under our Adventures section http://adventuredad.org/428/adventures/a-dad-takes-advantage-of-an-opportunity/ was a perfect example of how unique opportunities present themselves when on an adventure. 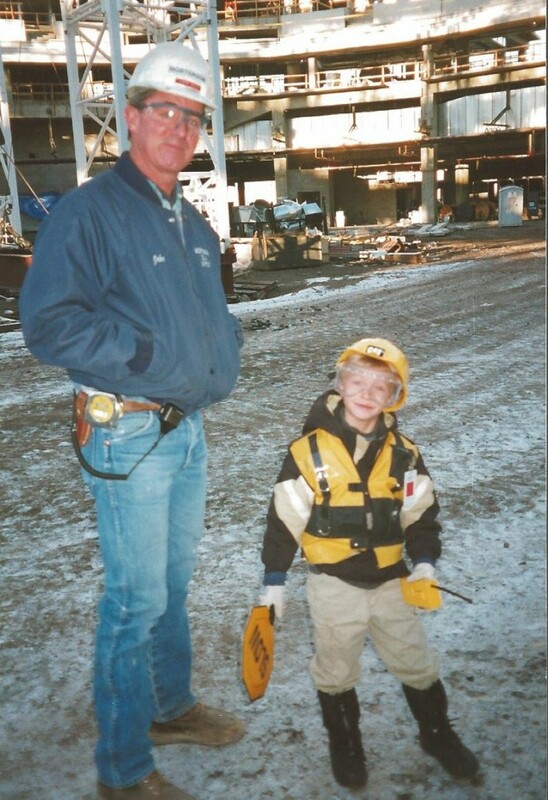 Doug wrote about getting a special offer from the snow patrol, I immediately recalled the time Alex was in preschool and we decided to go watch the building of the Pepsi Center, Denver’s home of the Avalanche and Nuggets. It was a Monday afternoon and I picked him up at lunch from preschool. He already had his construction clothes picked out and loaded in the car and was very excited about seeing all the big trucks and cranes; the names for which he had thoroughly memorized. We started our adventure in a nearby parking lot and watched the girders swing into place. Later on, we noticed an entrance gate where workers were coming in and out. Thinking there might be a possibility of a tour, we went over to ask if there were official tours of the site. An older gentleman came walking out and we took the opportunity to ask. He immediately said there were no tours. We thank him and began walking away when he said, “Is that your son?” I said yes and he said to meet him at the gate in an hour. An hour later we showed up as asked and quickly learned that the man was the project superintendant and he greeted us with construction helmets in hand. Climbing into his pick up, he drove us into the center of the Pepsi Center! It was still dirt on the inside and he explained how they were a day away from removing the 4 massive towers that were supporting the freestanding roof. What a thrill and an amazing learning opportunity for both of us. Later on, he drove us over to his office where we got to see the massive rooms full of blueprints. He also entertained us with stories about building Denver International Airport and how that massive project was completed. Needless to say, we both had plenty of stories to share with our friends. We relived the experience many times over, both at home and at his preschool, as we turned blocks and Legos into our own miniature Pepsi Center. In looking back, even if we hadn’t ran into the supervisor, we would have had a great time. True adventures, however, have a quality of the unexpected made possible by just slowing down and noticing what’s going on around you. My dad always said that everyone wants to be helpful and all you need to be is friendly and ask a few questions. Our first adventuremom reflects on her experiences with her son. It gets especially fun when they talk about how her son helped sooth her emotions. A helping hand which she offered extended to him for many years. Enjoy.